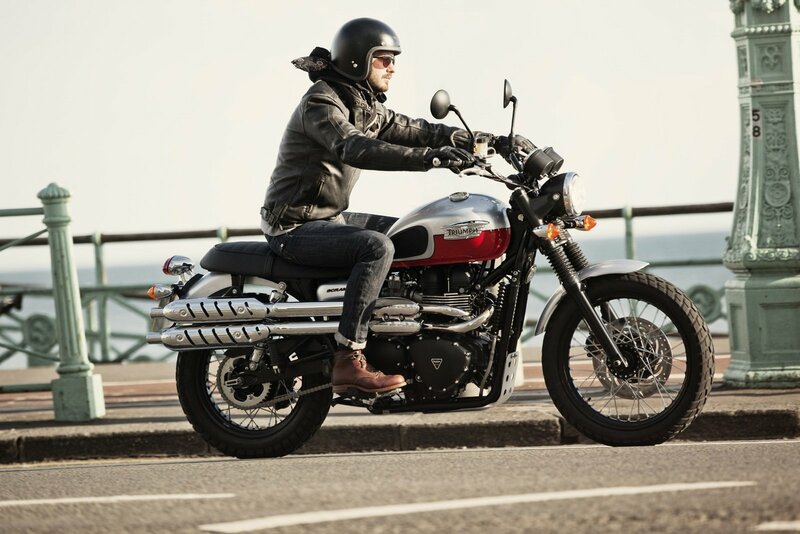 Founded in 1984 as Bonneville Coventry Limited, Triumph Motorcycles Limited carry with them a record marked with distinction in the annals of motorcycling history. From the heady sixties when their bikes dominated the racing and off-road scenes, with Hollywood icons such as Steve McQueen swearing by them, Triumph motorcycles have always evoked the carefree spirit of freedom and boundless possibility. 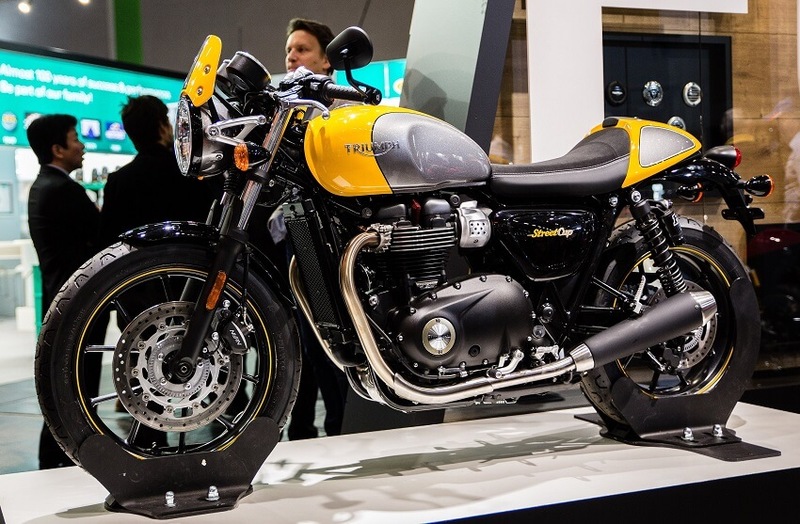 With an aim to satisfying their fans’ hankering for state-of-the-art motorcycles with a retro feel, they deliver in style once more with their latest offering- The 2016 Triumph Scrambler. The Scramblers’ 865cc 8-valve engine‘s designed to have 90 percent of its torque available from revs as low as 2500rpm. 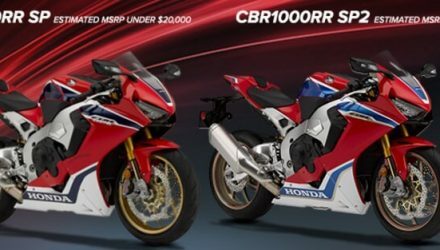 Multi-point sequential fuel injection, a 5-speed gearbox with multi-plate wet clutch backed up by a 1.2 gallon oil capacity add up to a ride that’s light, predictable and thoroughly engaging. 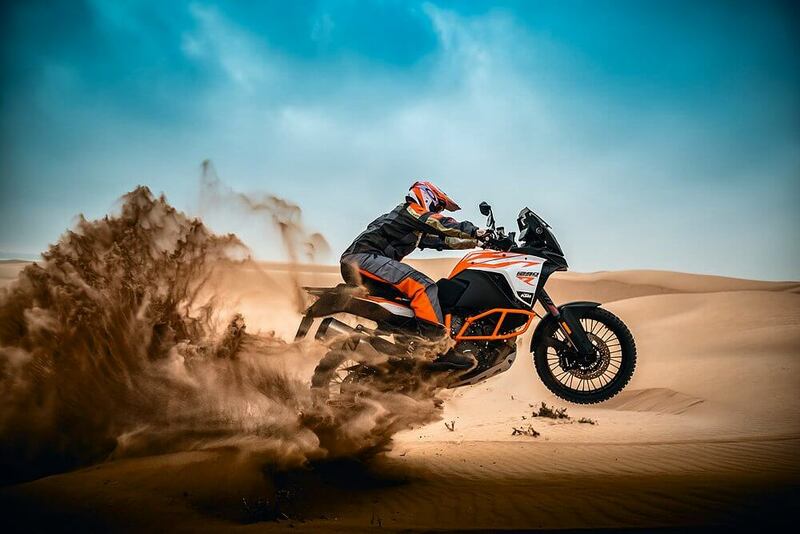 Exhausts lifted up and out of the way, it evokes the spirit of off-road fun and competition. Inclusive as standard are wire spoke wheels set in eye-grabbing 19-inch black rims and hubs. Block-treaded tires cement the off-road look while guaranteeing peak performance in all conditions. A single front disc brake provides confident, progressive stopping power without being overwhelming. 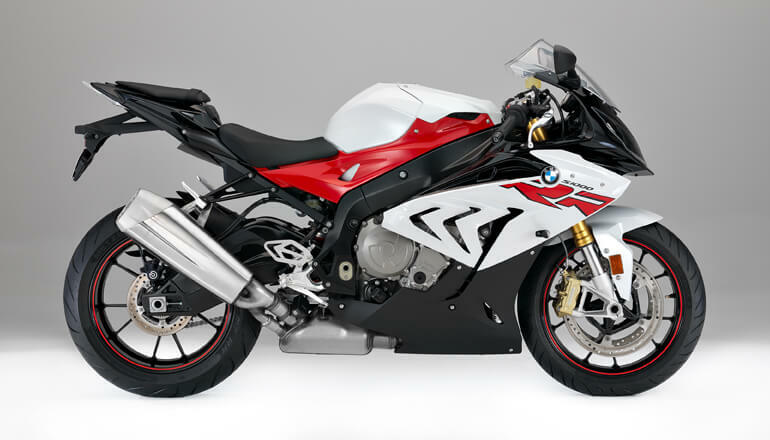 Classic-yet-modern chromed rear shocks and front forks with traditional rubber elbows provide comfort and controlled handling as well as protection against the harsher elements. 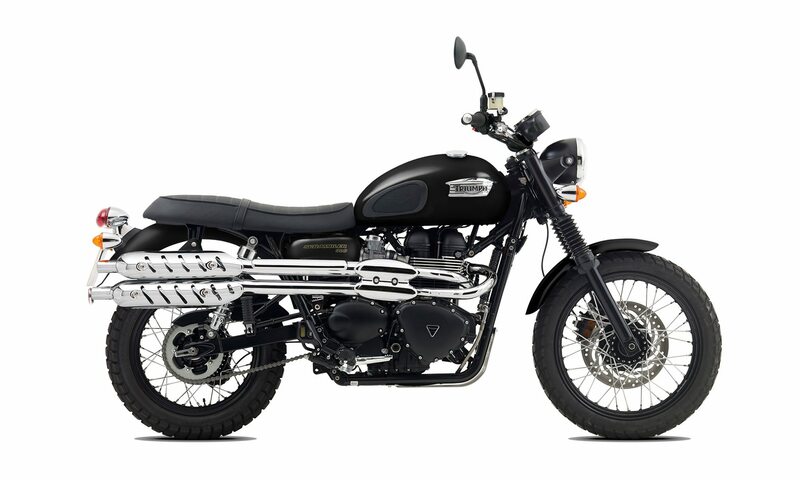 A brushed alloy skid-plate, chrome plated headlamp grille, textured black Engine Dresser Bars and a Tachometer kit with the Triumph logo all contribute to the retro appeal of this classic-racer inspired motorcycle. 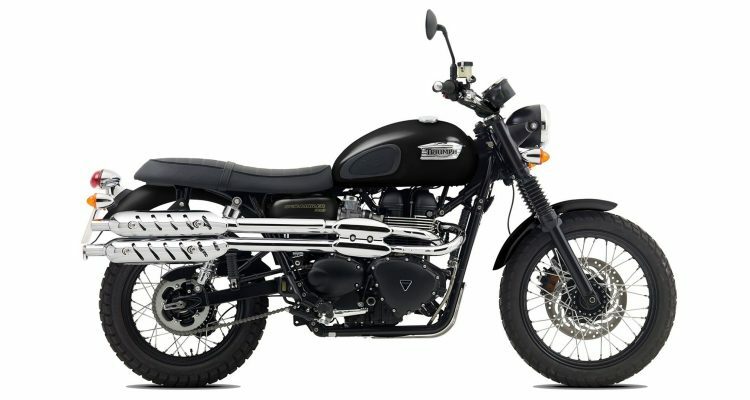 High and wide black-finished handlebars, raised footrests, as well as the traditional long, flat, Scrambler seat make for superlative comfort for riders and passengers of all dimensions. 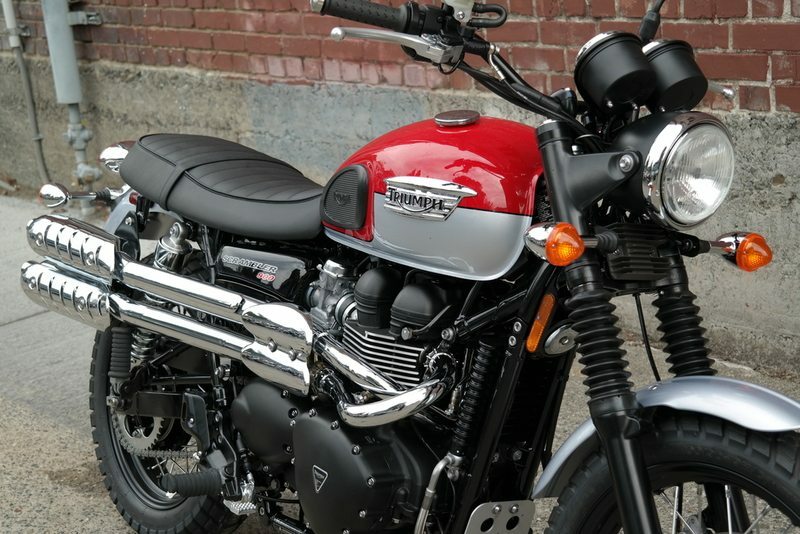 Slated to hit American roads in the latter part of the year 2015, the much-anticipated 2016 Triumph Scrambler will bear a Manufacturer Suggested Retail Price (MSRP) of $9400 US with the final sale price dependent upon options input and dealer factorizations. Warranty: The 2016 Triumph Scrambler comes with a confident Two-year unlimited mileage warranty as new in addition to a Twelve-month unlimited mileage warranty on replacement parts. 6,000 mile service intervals are the suggested optimum.